Creamy, dreamy, sweet, spicy and smoky. 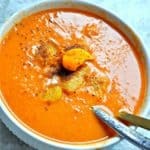 The BEST tomato bisque EVER! Tomorrow is the first official day of Fall! We made it guys! So, the weather is getting a little cooler, maybe soon we will need sweaters? The creation of meals that warm you from the inside out are my favorite meals to create. I can give you a little hug without being there in person. This vegan roasted tomato chipotle bisque is one of the most comforting meal I have ever had. A little spicy, a little smoky, a little sweet, served hot, it is Fall and Winter perfection! 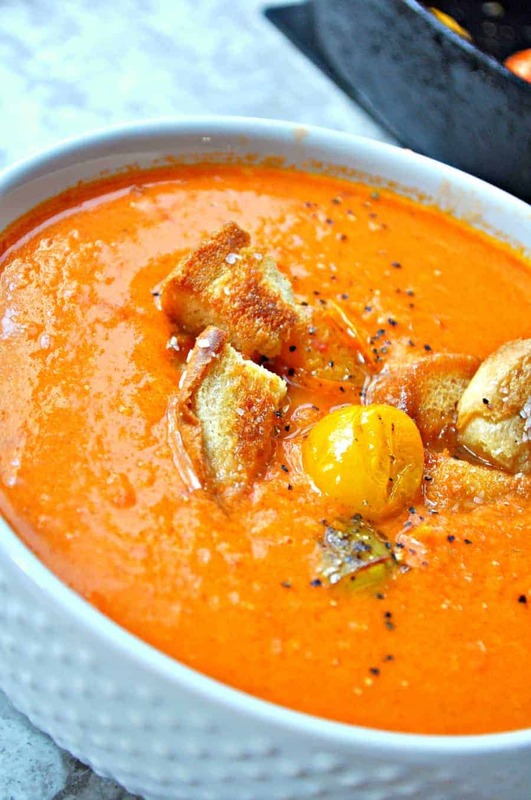 I am honestly not in love with tomatoes, but this bisque makes me rethink everything. Tomatoes are super versatile, so I always find ways to use them, but roasting them is one of the greatest things to do with tomatoes! It sweetens them and gives them such a beautiful flavor. 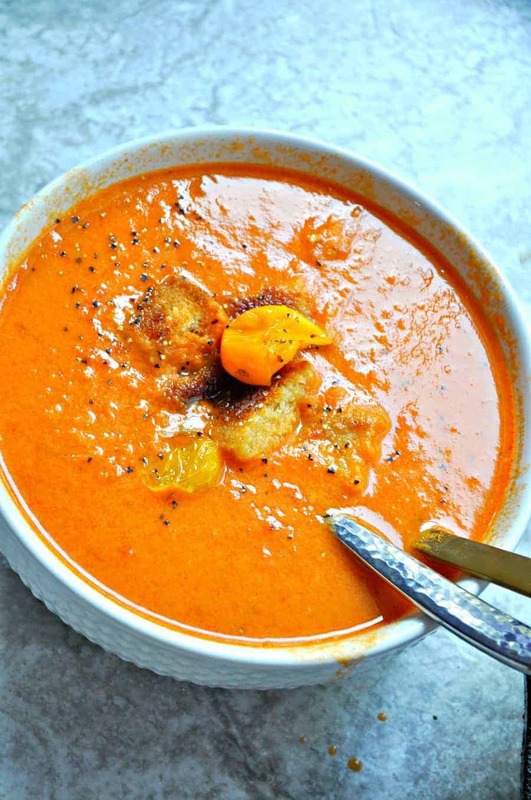 The roasted tomatoes blended with sweet onion gives this bisque the sweetness it needs to balance the spiciness. The spiciness comes from the chipotle peppers obviously, but they give it such a unique and wonderful smokiness. There is a real well balanced flavor happening here. I also like to add a bit of the adobo sauce that the chipotles come in, to add a little more smoke and flavor! The creaminess comes from coconut milk, it tastes nothing like coconut, I promise, but gives it just the right creamy feel and taste! This bisque is incredibly simple, and ready in no time for an easy weeknight cold day or a lazy weekend! 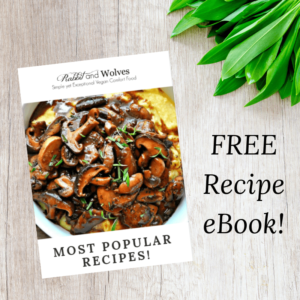 Serve with some vegan grilled cheese, and dip! It is my idea of the perfect meal. 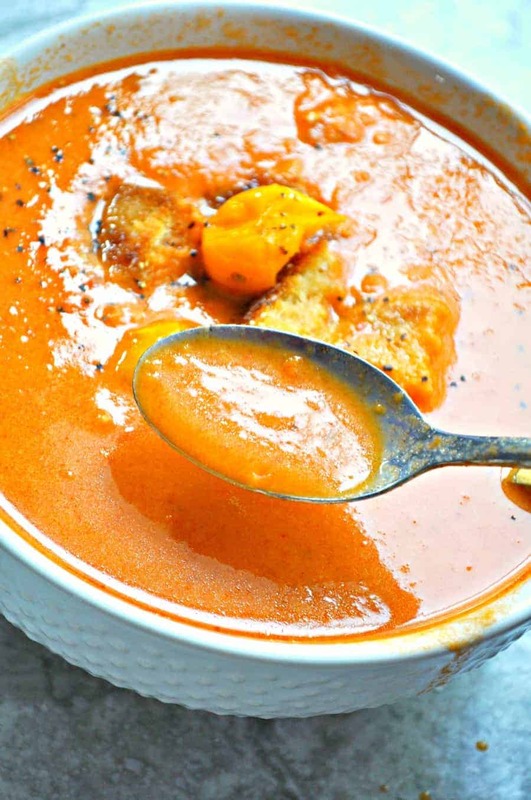 I guarantee you will love this vegan roasted tomato chipotle bisque! 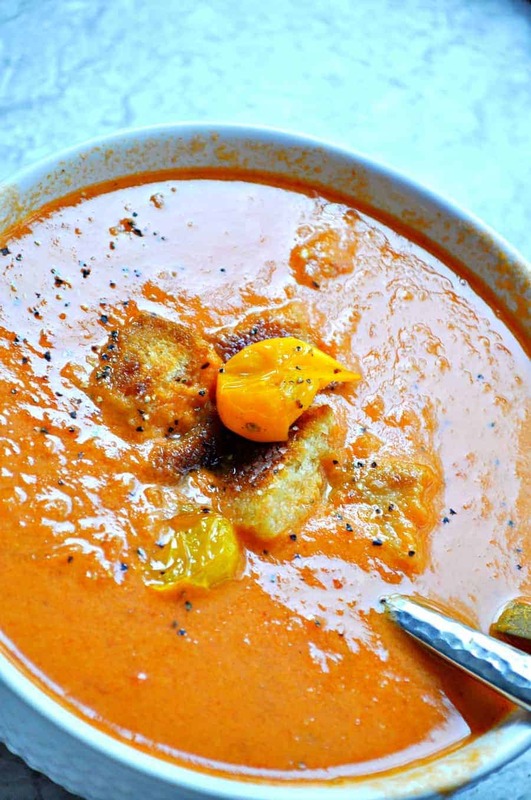 It is to die for, and I have to say, I can’t remember tasting a better tomato soup! Look no further, you have found the best! 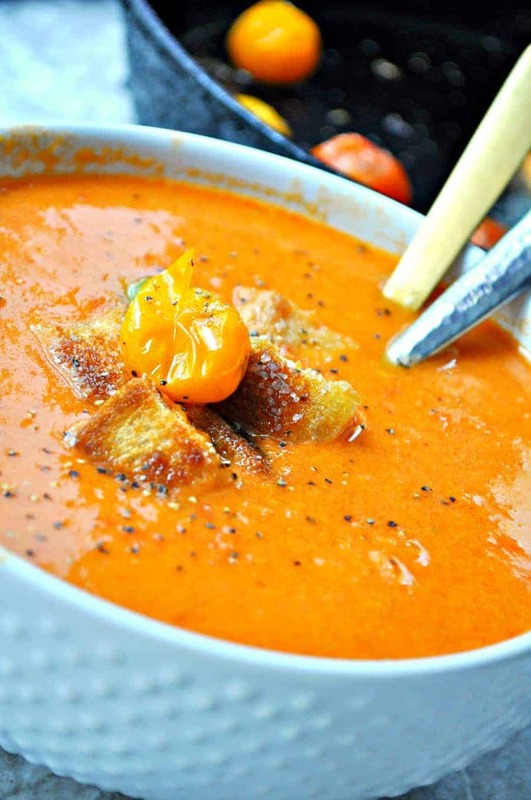 Creamy roasted tomato bisque made smoky and spicy with the addition of chipotles! Now cut the tomatoes in half or if they are large into quarters. Then toss in 1 Tbsp of olive oil and sprinkle with salt and pepper. Now, place the tomatoes on a sheet pan, and bake at 400 degrees for 15-20 minutes until they are juicy and have burst a little. They should be really soft and easy to smash. While the tomatoes are roasting, heat the remaining tablespoon of olive oil in a large soup pot on medium high. Now add the onion and garlic. Saute for a few minutes until the onion starts to become translucent. Reduce heat to low, and now add the agave and saute for a few more minutes until the onions have become a bit brown and caramelized. Now add the tomato paste, chopped chipotle and adobo sauce. Stir together and continue to cook for a few minutes on low. Season with a little salt and pepper. When the tomatoes are ready, pour them into the soup pot and stir to combine with the other ingredients already in the pot. Start to smash up the roasted tomatoes a little. Now add the veggie broth and coconut milk. Bring the heat back up to about medium and stir. Let come to a bubble, then reduce heat back to low. Now if you have an immersion blender, use it in the pot until the soup is completely smooth and creamy. If don't have an immersion blender, add the soup to a regular blender and blend on high until smooth and creamy, then return to the pot. Now, taste and adjust seasonings. Serve immediately with vegan grilled cheese or alone with maybe some croutons? If you are using a regular blender to blend the soup, I recommend taking the little plastic part out of the top and just placing a towel over the hole so some steam can release, if not, it can explode on you and hurt....a lot.